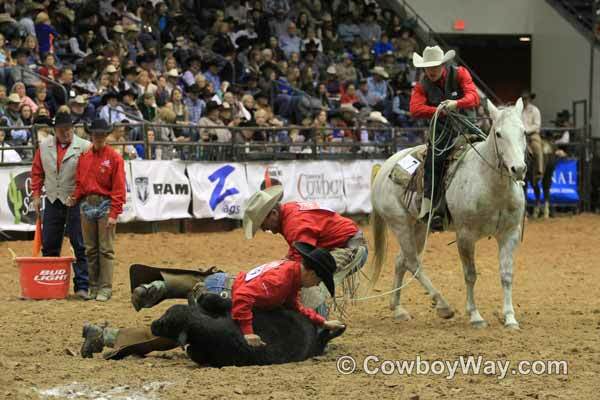 Ranch rodeo photos from the Working Ranch Cowboys Association (WRCA) Finals in Amarillo, Texas, 2014. 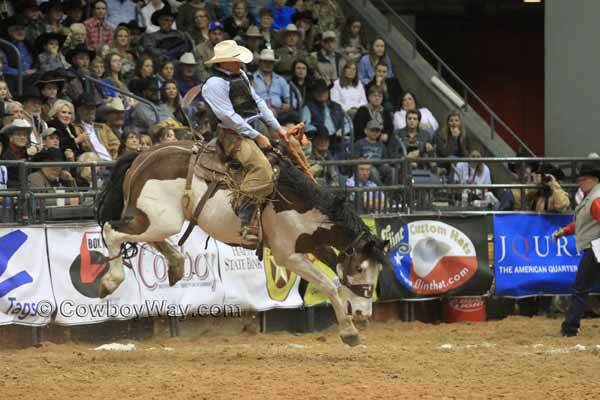 The WRCA holds the World Championship Ranch Rodeo (WCRR) each November in Amarillo, TX. For more about the WRCA please scroll down beneath the list of photos. 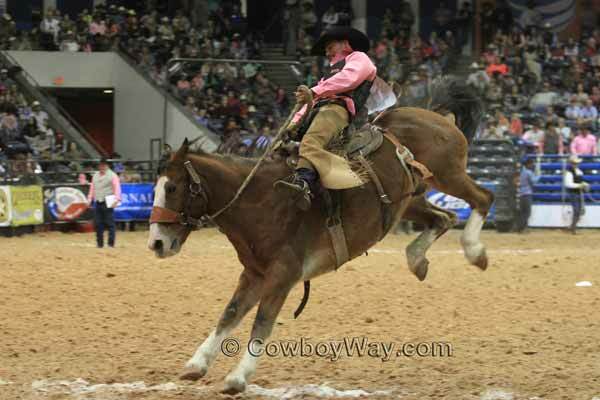 Below are photos from the 19th World Championship Ranch Rodeo (WCRR) held November 6th - 9th, 2013, in Amarillo, TX. At a ranch rodeo contestants do not compete as individuals as in a "regular" rodeo, but instead compete in teams representing their respective ranches. The Working Ranch Cowboys Association (WRCA) (<<< this link will open in a new window) is a governing body that sanctions ranch rodeos all across the country. 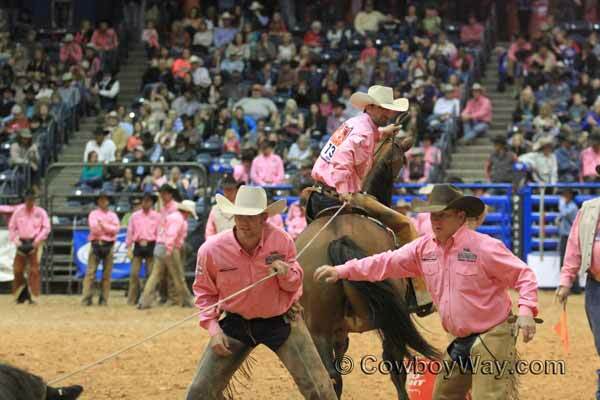 Each year the the WRCA competitive season ends with the World Championship Ranch Rodeo (WCRR) held in Amarillo, TX in early November. 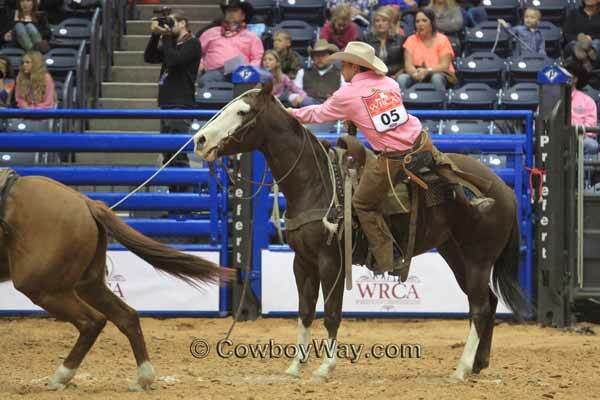 WRCA events include ranch bronc riding, stray gathering, team penning, team branding, and wild cow milking. The WRCA, founded in 1995, operates with the missions of promoting ranching on a national and international level and to preserve the lifestyle of the working ranch cowboy. The WRCA also provides significant financial assistance to working ranch cowboys and their families through their Crisis Fund and Scholarship Fund programs. 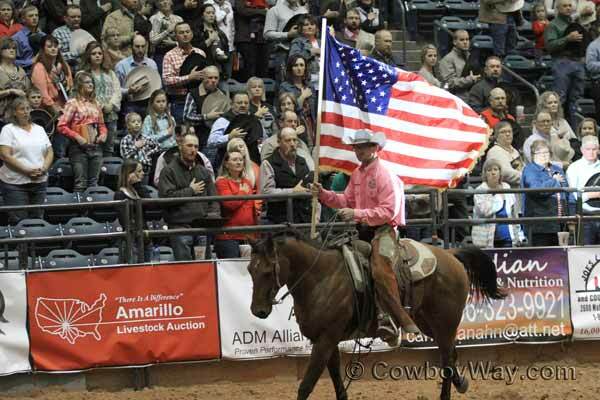 Chris Potter, Lonesome Pine Ranch, carries the American Flag during the opening ceremonies on Friday, November 7, 2014. 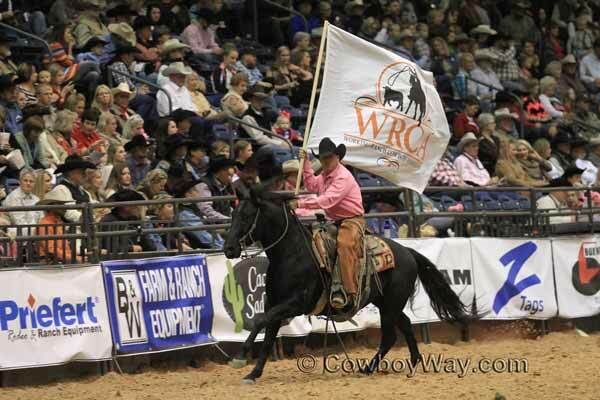 The WRCA Flag being presented during the opening ceremonies on Friday, November 7, 2014.